How Is 'Establishment' Mitch McConnell Faring In The Age Of 'Anti-Establishment' Trump? Senate Majority Leader Mitch McConnell speaks to members of the media at the Capitol in Washington, Wednesday, Nov. 7, 2018. Republican Senator Mitch McConnell of Kentucky may be the most powerful politician in America. McConnell began his first term in the Senate in 1985, and has served as majority whip and minority leader. He became Senate Majority Leader in 2015, then found himself in new territory when President Trump took office. Joining Cincinnati Edition to discuss how Senator McConnell is navigating the current political landscape under the Trump administration and with Democrats in control of the House are Frost Brown Todd attorney and former Kentucky Secretary of State, Trey Grayson; Northern Kentucky University Chase College of Law Adjunct Professor Col Owens. Owens is also former longtime chairman of the Kenton County Democratic Party and an unsuccessful candidate for a Northern Kentucky statehouse seat last fall. And WVXU Senior Political Analyst Howard Wilkinson (@howardwilkinson). 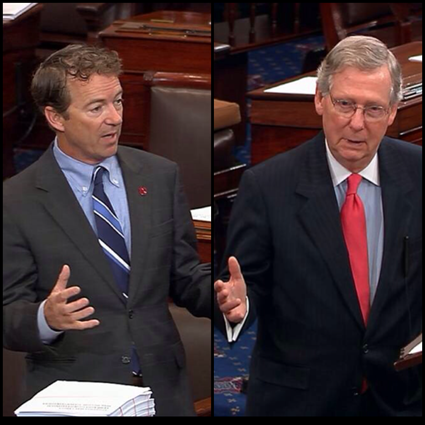 Kentucky's two U.S Senators both have well-funded political action committees. But the two spend their PAC money in very different ways. The Louisville Courier-Journal reports Republican Mitch McConnell spent the majority of funds last year from his PAC, the Bluegrass Committee, on national, state and local campaigns. About 80 percent of donations to the Bluegrass Committee came from other PACs, instead of individuals. After Democrats won control of the U.S. House of Representatives on Election Day and made small gains in the Kentucky General Assembly, Senate Majority Leader Mitch McConnell says he's "not happy" with how Republicans performed in suburban areas. Last November, Sherrod Brown of Ohio was elected to his third term in the U.S. Senate. The Democrat served as the U.S. Representative for Ohio's 13th congressional district from 1993 to 2007. Brown started his political career as an Ohio state representative in 1974.